An April blizzard covered Baileys Harbor in a foot of snow overnight Saturday. Another 8 – 15 inches is expected to fall by the end of Sunday, with drivers urged to stay off the roads due to hazardous conditions. Photo by David Eliot. 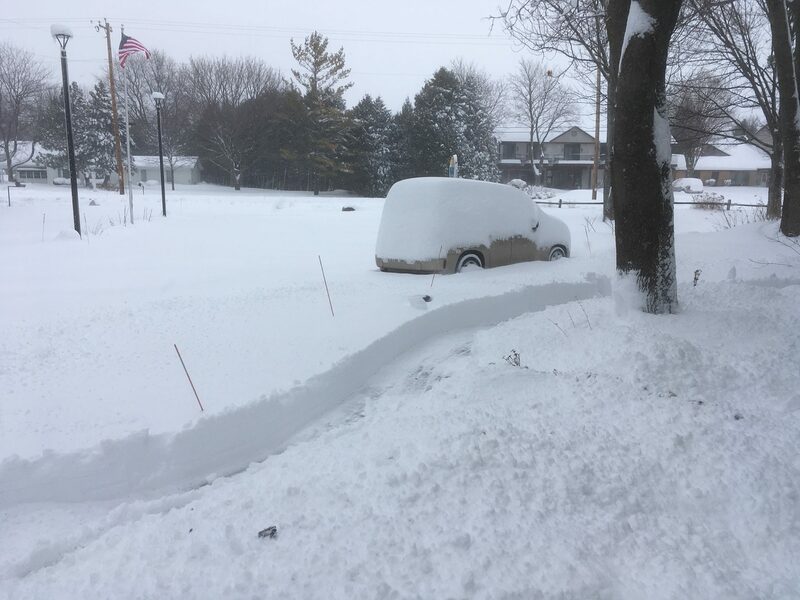 Door County was buried in 12 – 16 inches of snow by Saturday morning, with more snow expected to blanket the area again by Sunday evening. 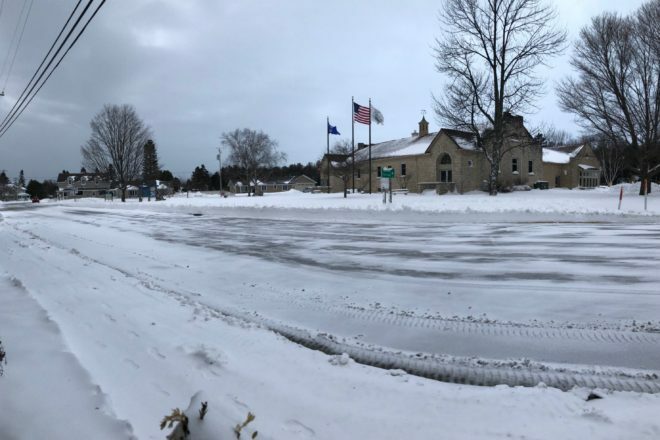 Warnings from the National Weather Service called for an additional 8 – 15 inches in Door County overnight, with blizzard conditions bringing winds as high as 60 miles per hour. A winter storm warning remains in effect until midnight Sunday. Door County Highway Commissioner John Kolodziej issued a plea early Sunday morning for people to stay off the roads. The snow is wet and heavy, making it even more difficult to move. Many roads are covered in ice. Crews worked until 6 pm Saturday, with some remaining on the highways to clear roads for emergencies. Crews were scheduled to head back out at 2 am. Earlier Saturday, Kolodziej said that many vehicles already stuck in the roadway are creating problems and slowing the snow removal process. Sturgeon Bay Mayor Thad Birmingham asked residents to stay off city streets during the storm. Concerts, high school athletics, and meetings across Door County were canceled Saturday and Sunday. The Door County YMCA announced that its facilities in Fish Creek and Sturgeon Bay will be closed Sunday. The storm has made this the snowiest April on record. Monday’s forecast calls for blustery conditions with snow and freezing drizzle in the morning and into the afternoon. Up to two inches of snow is expected, with highs in the middle 30s and wind gusts up to 25 miles per hour. By Saturday morning the storm had dumped a foot of snow in Egg Harbor. Photo by Myles Dannhausen Sr.
As of Saturday night, Wisconsin Public Service said crews were still working to restore power to about 1,800 customers in Northeast Wisconsin. Crews have encountered tree limbs on power lines, downed trees and downed wires.